As strange as it may sound these days, there are successful businesses and important institutions out there that are still hoping to make the transition from a paper-based world to a dynamic digital environment. Among the solutions available to help them make the migration: new hardware and software solutions from Nureva, an early stage technology development company based in Calgary. But the company is placing its stake in the cloud, and it’s just returned from major conferences in the United States where it was showing systems for classroom activities, called Troove, and for business development, called Span. Nureva’s systems support collaboration among multiple participants, whether they’re professionals meeting in a physical business board room, or students and educators connecting in a virtual classroom. The Span system lets participants use their own computer or tablet to create and share ideas in a large, projected workspace. Such collaboration is called ideation, a term coined to encompass the creative process of generating, developing, and communicating new ideas or thoughts that can be visual, concrete, or abstract. Like ‘blue sky-ing’ in a meeting, ideation should not be limited by conventional notions of what is practical or feasible, and likewise, tools that supporting ideation should not be impractical or difficult to use. Using online, cloud-based tools, the business tool Span lets company staff easily join in blue sky type ideation meetings where creative processing, problem-solving and business-process reengineering can be conducted, among other shared tasks. The educational Troove software lets users to collect, evaluate, share and showcase academic (and personal or professional) achievements in a digitally-mediated space. Handy for business users, the Span system lets participants use their own personal devices, either a computer or tablet, to create and share ideas with their team on a large, projected workspace. The system presents users with familiar, paper-based work tools but with added functionality, including digital sticky notes, images, pages and flip charts. Users can create small digital sticky notes with up to three lines of text, or they can opt for a larger digital page for sketching and wire-framing, using one of three different ink colours, a highlighter and an eraser. There’s an even larger digital flip chart tool, called Folio, with multiple pages that can be used to capture notes, decisions and action items. These appear on a projected digital canvas, which displays the documents and collaborative output, while storing and retaining the information for subsequent use. Sticky notes won’t fall off the board like they used to, and notes will not disappear when the team has to vacate the physical room in which they meet, because the Span ideation system lets multiple teams re-visit their virtual collaboration room at any time in their project’s lifespan (rather than tying up a meeting room and blackboard for months). The system presents users with familiar, paper-based work tools but with added functionality, including digital sticky notes, images, pages and flip charts. The Span ideation system retains those paper-based meeting metaphors, such as the sticky notes and flip charts of old, to smooth out the bumps encountered when transitioning to a digital environment, said Nancy Knowlton, Nureva’s CEO, when launching the product, in order to embed a sense of familiarity, simplicity and flexibility. What’s more, there’s touch and pen interactivity built in, supporting simultaneous multiuser and multitouch activities. High brightness projectors are used to display the digital workspace, and systems are available with one or two projectors, depending on the size of canvas required. 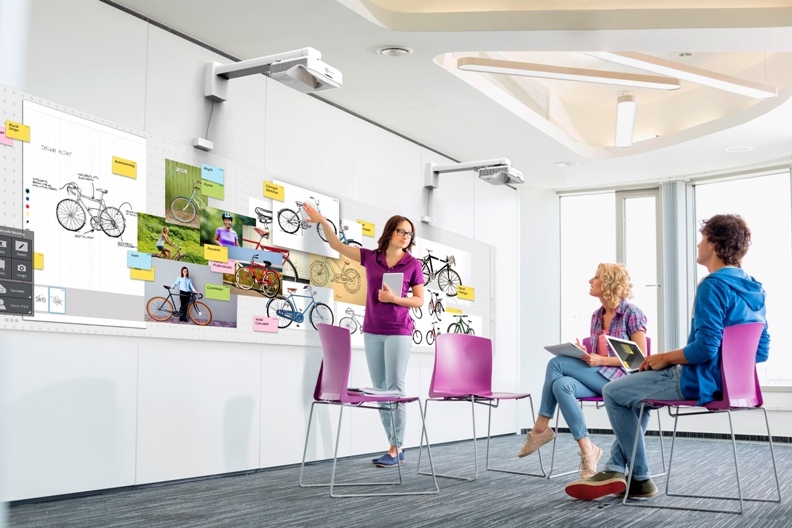 The single-projector Span system creates a workspace display that stretches 10 ft. (3.1 m) by four ft. (1.2 m), by 130 inches (3.3 m) (width, height, diagonal measures). 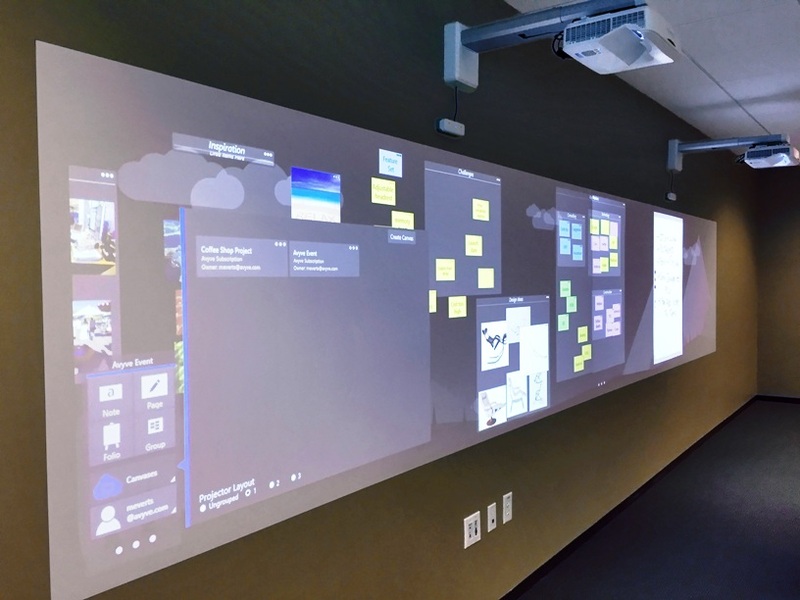 The newest system includes two panoramic projectors installed side-by-side to create a 20 ft. wide (6.1 m) seamless collaboration space that’s 245 inches (6.2 m) on the diagonal. The images from the two projectors are melded into one with an image-alignment module included in the system. As part of its own ideation and product development process, Nureva is talking the talk and walking the walk. 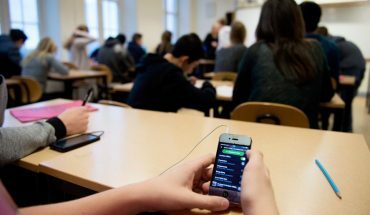 The company has launched a large-scale research initiative into the use of its Troove classroom product portfolio, and it is offering a year-long product subscription to as many as 500 schools in the United States and Canada. That’s in return for their feedback and insight. Selected schools will also receive training, a step-by-step implementation guide for Troove software along with personalized consultation for the 2015/16 school year. Applications are open through September 30, 2015, and will be evaluated as received.